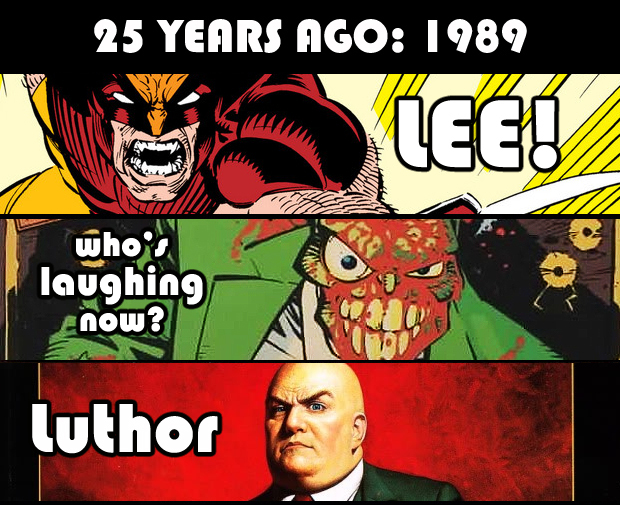 Taking a look back at ten, twenty-five, fifty and even seventy-five years of May comicbook anniversaries! FURY! Along with Teen Titans by Johns, Outsiders, Loeb’s Superman/Batman, Rucka on Wonder Woman and Adventures of Superman, and a few others, the new Firestorm title would be another beat within the DCU that would lead to one of its greatest storytelling eras. With this new number one we are introduced to the new Firestorm, Jason Rusch, and we’re left with the question of what exactly happened to the old Firestorm, Ronnie Raymond. 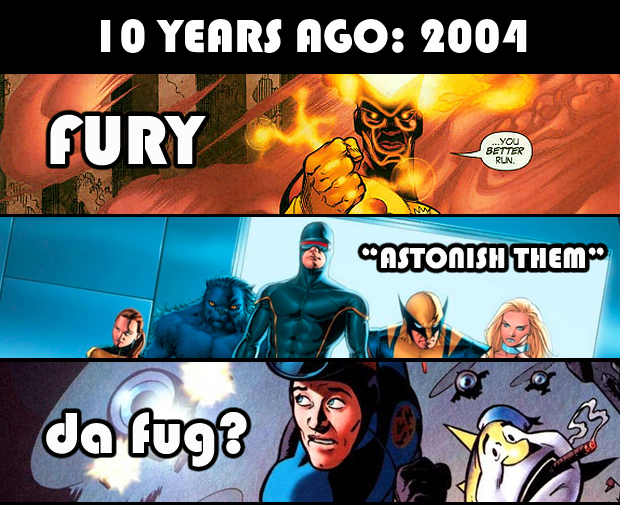 It’s a question that would be answered by Identity Crisis and later Firestorm issues. This volume had its ups and downs, but I found it to be very enjoyable, especially when they pulled in elements from the ’80s run. Plus, any title that keeps ChrisCross in comics is a good thing. “ASTONISH THEM”! With the ending of Buffy, it was only a matter of time before Joss Whedon got his hands on some mainstream comics. And with John Cassaday and Laura Martin, the new Astonishing X-Men title delivered. The title itself probably should’ve been nixed once Whedon left – much in the way that Superman/Batman never really had the same weight once Loeb left – but for his tenure, it was a decent read. Not to mention that it gave Colossus back to the readers and brought in Kitty Pryde as the Whedon/Buffy stand-in. DA FUG? What can I really say about Grant Morrison’s Seaguy other than that it was definitely unique. And it was probably the first time I was exposed to the art of Cameron Stewart and I’ve been an admirer of his work ever since. OTHER: Starting with a focus on the X-Men, the Official Handbooks of the Marvel Universe return in oneshot format until Marvel releases a twelve issue run in 2006; Chris Claremont returns to the X books for the third (?) time, this time with Alan Davis on art, starting in Uncanny X-Men #444; speaking of Alan Davis, the first issue of his Justice League: Another Nail Elseworld sequel begins; Thor #79 ends Dan Jurgens lengthy run on the series that began with artist John Romita Jr. after the events of “Heroes Return”; the first issue of Chuck Dixon and Scott McDaniel’s Richard Dragon hits the stands lasting twelve issues. LEE! It’s not the beginning of his most acclaimed run, but Jim Lee does the art for his first Uncanny X-Men issue in #248. And the rest would be history. ‘Nuff said. WHO’S LAUGHING NOW? If my research is correct, the four issue Mayhem Dark Horse series gave us the definitive version of the character that would be known as the Mask. Created by Mike Richardson years earlier, and given his most well-known design by Chris Warner before the mini-series, Mayhem itself was by John Arcudi and Doug Mahnke. The character’s success would obviously lead to the Jim Carrey movie. LUTHOR! The Unauthorized Biography. Art by Eduardo Barreto. Written by frequent Eclipse writer James D. Hudnall (of ESPers). It was a dark story exploring the new post-Crisis businessman version of Lex Luthor. It may also be the first time his father is named as Lionel although I’m not 100% certain on that. OTHER: Beautiful Stories for Ugly Children begins its thirty issue run with DC’s Pirahna Press; Amazing Spider-Man #320 starts the “Assassin-Nation Plot” arc. THE HUNTER! Kraven, the Hunter has his first appearance in Amazing Spider-Man #15. One of the most acclaimed Spider-Man stories is “Kraven’s Last Hunt” featuring the character. I doubt there are many other Spider-Man stories that can match up. OTHER: X-Men #6 apparently is the issue that reveals that Prince Namor the Sub-Mariner is actually a >gasp< Mutant! THE ONE AND ONLY! Superman is so popular in Action Comics that DC creates a second title featuring the character. Superman #1 hit the stands more or less around this time 75 years ago. OTHER: Action Comics #13 is the first appearance of the Ultra-Humanite, the oldest Superman villain still in use today.